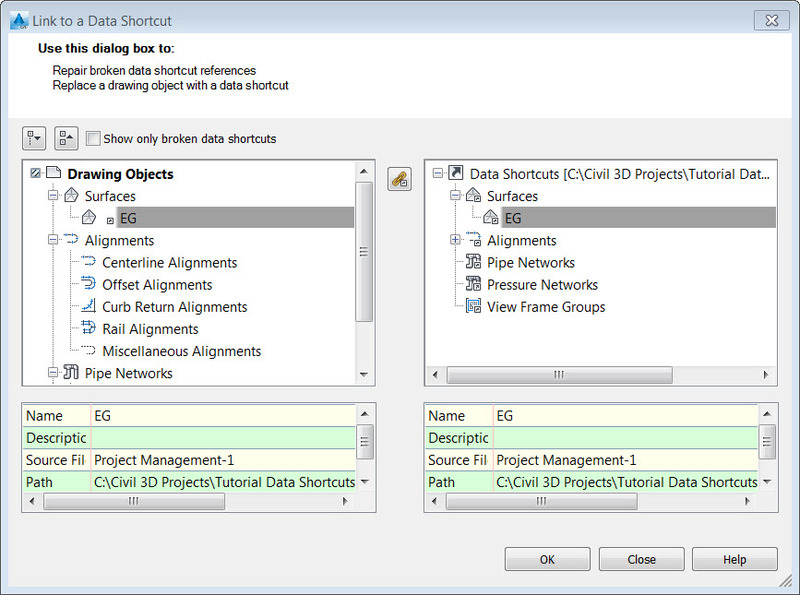 A new feature introduced in Civil 3D 2016 is the Manage Data Shortcuts command. This command gives the user a really nice dialog for repairing broken data shortcut references. It also gives the user the ability to replace a drawing object with a data shortcut from the current data shortcut project list. The command is found on the Manage tab of the ribbon. 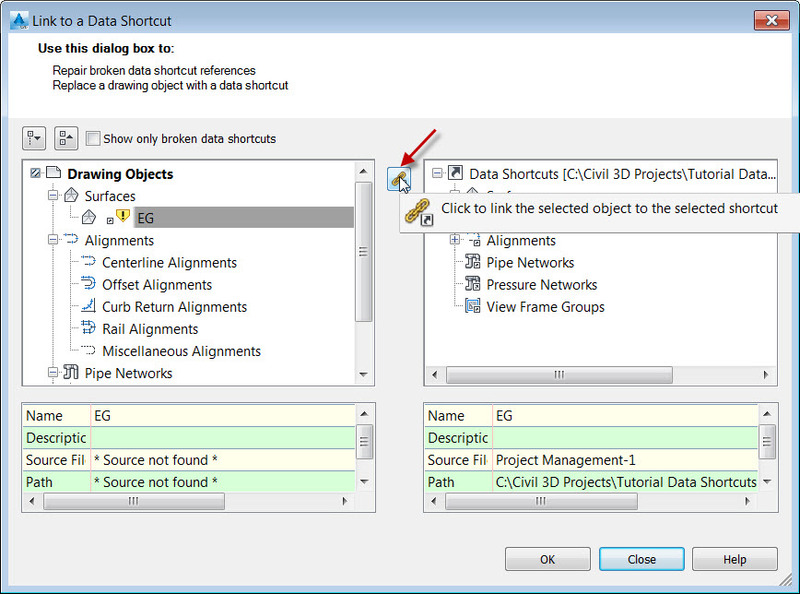 When the user launches the command and the dialog box appears, the drawing objects will be located in the left-hand window; and the data shortcut objects found in the current data shortcut project will be located on the right-hand side. Below each selected object will be listed the object name, description, source file and file path. This makes for a really nice side-by-side comparison. 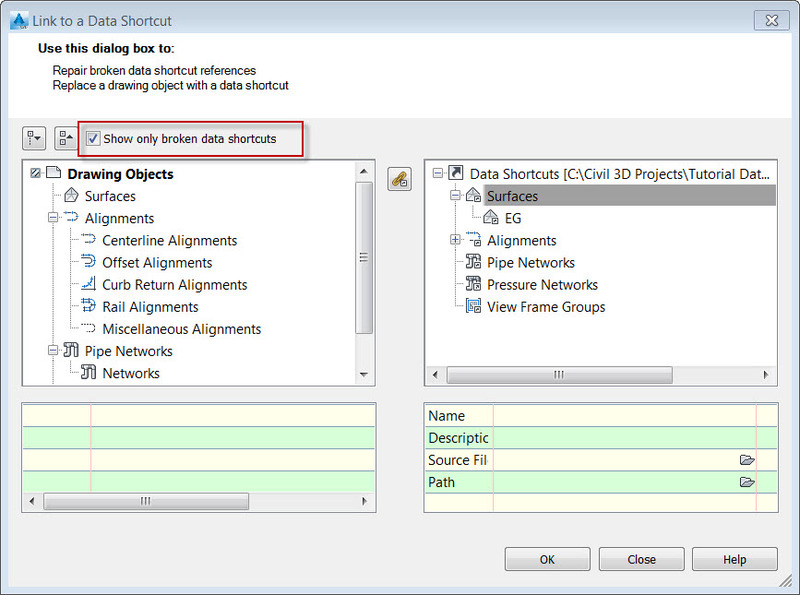 There is a check box in the upper left-hand corner of the dialog which allows the user to only see the broken data shortcut references. If checked on and no objects show up in the left-hand window; that means all reference objects are in good shape. When a reference is broken and it needs to be re-linked to the source data shortcut, doing so is easy. There is a button right in between the two dialog windows for doing just that. Select the drawing reference object on the left and select the data shortcut on the right, and then click the link button in the middle to repair the reference. This same button can be used to replace a drawing object with a data shortcut.